The Realm database. The storage and transactional manager of your object persistent store. It is in charge of creating and removing instances of your RealmObjects, querying, and performing transactions. Read more. A configuration object that is used to setup a specific Realm instance. Read more. The super class of all objects (models) that are to be stored in Realm. 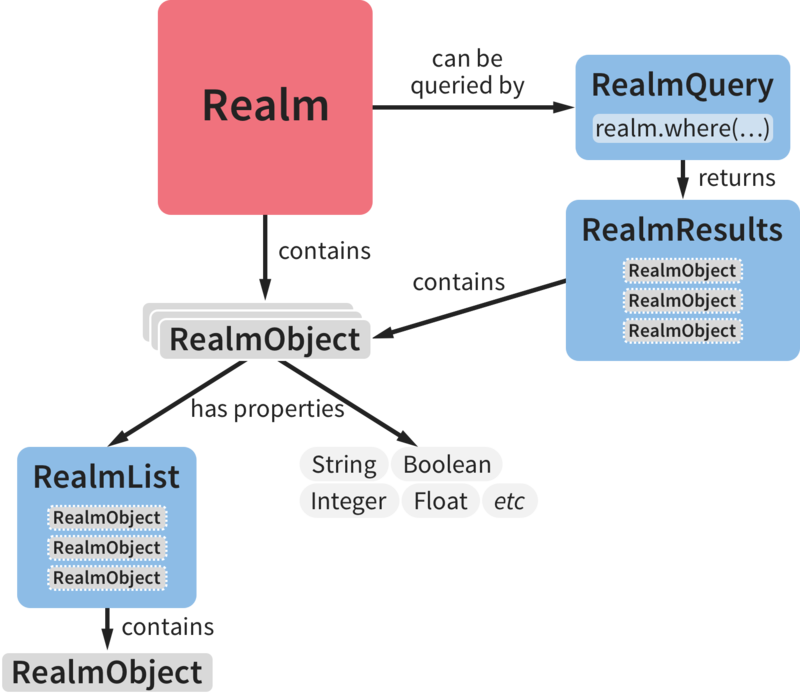 A Java object must extend RealmObject in order to be considered a RealmObject. Read more. A List that is used in RealmObjects to model one-to-many relationships with other RealmObjects. Read more. An object that encapsulates a query as defined through Realms fluent query interface. Queries are executed using either the RealmQuery.findAll(), RealmQuery.findFirst() or their variants. Read more. The result set of an executed RealmQuery for a given Realm. RealmResults are live, auto-updating views into the underlying data, which means results never have to be re-fetched. Read more.